We source our Drainage Pipe and Fittings from a UK Manufacturer. All products are tested, approved and kite marked to prove their quality and acceptability for use in the UK. They are selected for their mix of high quality and low price making these fittings the best bang for buck possible. 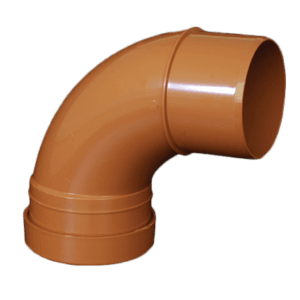 What is an Underground Drainage Pipe? At EasyMerchant we keep in stock 110mm Underground Drainage Pipe and 160mm Drainage Pipe, 200mm, 315mm and 400mm diameters, meaning we can source any product for any underground drainage system. We also have 320mm and 450mm inspection chambers available for access to any blockages or for general upkeep. 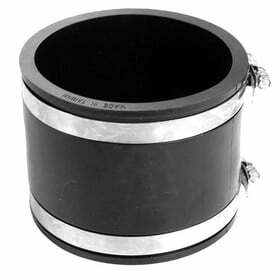 We have a range of non-return vales and flexible couplings also available. The underground sewerage system provides an efficient means of removing waste water and foul discharge from above ground drainage installed in the home. The range includes a variety of bends, couplings, gullies (including a bottle gully, a back inlet gully) traps, and inspection chambers / access chambers that integrate with EasyMerchant's stocks of above and below ground drainage that will suit most installations. Manufactured in PVC-U to provide a durable and strong product, easy and lightweight to work with. The system is suitable for waste discharge. Until the last quarter of the 20th Century and before the widespread adoption of plastic as a suitable material - Sewer pipes and fittings were made from vitreous clay, cast iron, pitch fibre or asbestos cement. 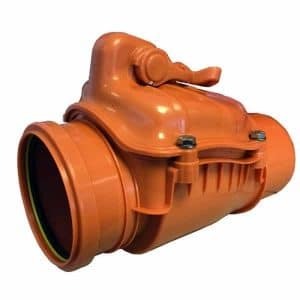 Whilst nearly all the goods are no longer used with this particular application, clay drainage is produced in the United Kingdom and it is still favoured by some developers though it isn't as easy to work with as thew plastic pipe, as it requires power tools to install. 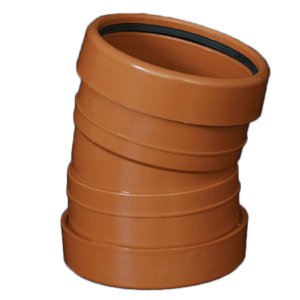 Plastic sewer pipe work comes with much longer working life spans, significantly stronger joints and it is a lot lighter than clay is. It is also much easier to cut and install for the average surface water solutions contractor - and you can build an entire sewage system, from pipes and bends through to manhole covers and inspection chambers out of the one same material. Again how it's installed, as well as the pipe bedding that is used are important as these drainage pipes can be prone to root ingress and deformity if not installed to the correct specification. At EasyMerchant we highly recommend you chose a sewer pipe system that is Kitemarked and manufactured to BS EN 1401 Standards. What are Underground Drainage Systems Made From? At EasyMerchant, we only sell plastic underground, and not steel, clay or other sewer pipes, so we'll focus on these here. They are made from PVC (Polyvinyl chloride) a substance that was unintentionally synthesised in 1872 by German chemist Eugen Baumann. This form of PVC is used in construction for drainage pipe and in profile applications such as windows and doors. It is also used in making bottles, non-food packaging, and cards (such as bank or membership cards). This is the chosen material because of it's excellent chemical resistance properties (It is - importantly - insoluble in alcohol but slightly soluble in tetrahydrofuran) and it's high heat resistance and long working life. It is also a cost effective material to manufacture, meaning PVC drainage pipe is available at a much more affordable price and is a more practical solution. Is Plastic Better than Clay? 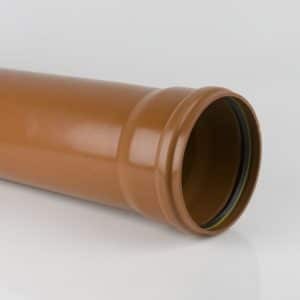 Both kinds of materials have their supporters, but plastic is by far the most popular underground drainage material in use today in the UK building sectors, mostly because of price, but also because PVC pipes are a lot lighter and therefore more easy to manage on site and builders favour it. Plastic pipes are simple to cut, needing nothing more than a fine-toothed saw, whereas clay drainage requires using cutting disks or specialist tools. PVC sewer pipe has smooth walls, with minimal friction delivering exceptional flow rates when compared to the natural finished surface of a clay pipe. 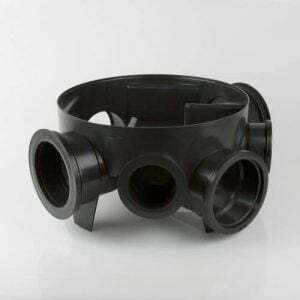 Whilst all PVC manufacturers' fittings and pipes vary in size by fractions of millimetres, all BS EN Standard approved plastic drainage systems are made within particular dimensions and tolerances, meaning that all such approved systems may be inter-connected without the need for adaptors, saving any confusion and minimising leakage when connecting into existing systems. What are Drain Pipes & Systems Used For? In this case; surface water pipe systems, and underground sewer systems. A sewer or foul sewer is an underground pipe system for transporting sewage and rainwater from the home and/or commercial buildings (although not stormwater) to treatment centres or disposal. Sanitary sewer systems are valuable since they avoid combined sewer overflows. It's not used for above ground purposes as it doesn't contain any UV stabiliser (a costly additive to PVC) and therefore it will quickly fade in sunlight. At EasyMerchant we stock 110mm (4 inch), 160mm (6 inch), 200mm (8 Inch), 315mm (12 inch) and 400mm (16 Inch). The waste water pipe comes in 3 metre of 6 metre lengths. Bends come in a range of angles and the manhole bases come in sizes 320mm and 470mm with 110mm and 160mm outlets. The manhole base risers are 225mm high. What Different Items are Available In This Range? 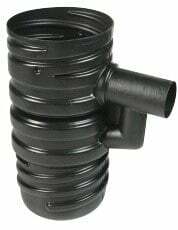 At EasyMerchant we stock all the necessary pipe and fittings this includes 3m drainage pipe, drainage bends in double and single socket forms in degrees from 15 to 90 at a price you won't find anywhere else. We also keep Y (135 Degree) and T (90 Degree) Junctions / Branches in double and triple socket forms as well as manhole bases / inspection chambers in 320-450mm sizes with both 110mm and 160mm outlets. We also keep roddable and back inlet bottle gullies, hoppers, integral hoppers as well as lowback P traps and regular traps. EasyMerchant also sells products that make the installer's lives easier, such as the adjustable bends and adjustable bottle gullies. 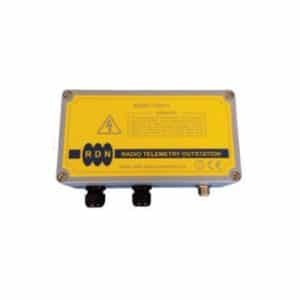 We also have additional add-on ranges such as non-return vales, flexible couplings / adaptors and even warning tapes and sewer blockage alarms! All supplied at a fantastic low price. We also have all the fixings, sealants, lubricants, and accessories available allowing you to buy everything you need for the job. There are some well established UK based manufacturers such as Polypipe, Brett Martin, Floplast, Terrain, Marley, Hunter, Kalsi Plastics among others. There are also some excellent quality European fittings on the market, such as German made brands such as Funke and Magnaplast. All of these manufacture great products but at a highly changeable price for what is essentially the same items! We have accounts with most of these large manufacturers and we do shop around from time to time to ensure we are able to bring you the best possible price, but we always make sure whatever system is in stock, that it's made to BS EN 1401 and complies with all necessary standards as well as being fully compatible with other BS EN products. Meaning you're installing the correct products for your home. Underground drainage is a fast moving product for us, so for us - mostly in the boxes it comes in stocked inside our warehouses. 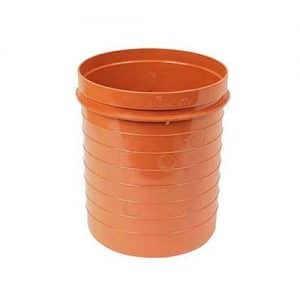 However if you're storing it on site or in a builders yard, make sure it is stored out of direct sunlight as the sunlight will quickly fade the terracotta dye used in the PVC turning it into a white colour. This is actually not an issue with regard to the performance of the drainage pipe, however it does not look professional and the terracotta identifies it as a sewage pipe. The 3 and 6 meter drainage pipes should also be stored on a flat surface, especially if it is in an area that can get hot in the summer, as this can cause bowing or snaking pipes. EasyMerchant will load these onto our vehicles in bags or boxes depending on the quantities ordered. We make sure all of our items are well packaged for safety of transport for delivery. Once you click to place your order, you can rest assured it'll be delivered in excellent condition. The system is based around the "ring seal push fit" system (usually found in the socket of the bend or pipe). 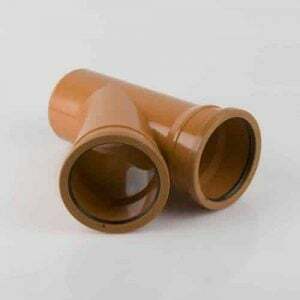 Usually a pipe lubricant will be used around the seal of the socket of the fitting and a properly chamfered pipe in the correct diameter, or spigot end of the bend will be inserted into the socket of the fitting. This is a simple process, but issues can occur when these instructions are not adhered to! Do not use fairy liquid to lubricate the seals, and always make sure the pipe is nicely chamfered with no sharp edges. Check that the seal has not fallen out, been displaced or damaged. Technically anyone can, along as the proper guidelines are adhered to. This counts for a DIY-er, to a plumber, to a builder, ground worker, landscape gardener or a civil engineer etc. Always follow government guidelines (read The Building Regulations 2010, Drainage and Waste Disposal - Approved Document H) and check with local authorities before carrying out any work. Responsibilities for sewers and drains changed in October 2011. The pipe work and linking drains from the property to the sewer or lateral drain within the border are the responsibility of the property owner - unless other possessions drain through it. All sewers outside of your property boundaries and any sewers shared with another property are our own responsibility. Though you should always check with your local council or authority before carrying out any work.